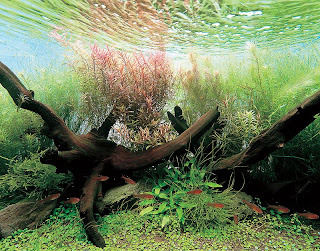 In the world of aquascaping and planted tanks, there are two major schools of thought: the Dutch style and the Nature style (also called Japanese style, but not to be confused with the el Natural style which is not a style of aquascaping but an entirely separate approach to keeping a planted aquarium). Both are popular styles that are based on the arrangement of plants in the aquarium and the way it is aquascaped and are by no means the only way to aquascape a tank. Most hobbyists choose to loosely follow one school based on their own personal preference of what they think looks better. Dutch aquariums are an older style of aquascaping, dating back to early 20th century Holland. The style focuses on neat rows of plants radiating out from a central focal point, with lower plants in front and taller plants in the back (creating depth). You'll often see this described as "streets" or "avenues" using plants. Dutch aquascapes also feature more colorful aquatic plants. They can be likened to a well kept garden, where all the plants are arranged with a purpose and kept well trimmed and defined. It may not be the most natural looking, but it is extremely beautiful and visually interesting. A significant hardscape (rock and/or driftwood) is usually not present or visible. Color, contrast, and the beauty of the individual plants is paramount. 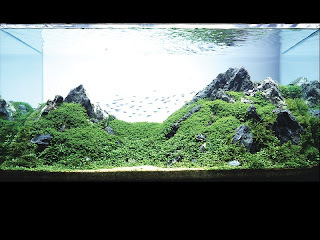 The Nature aquarium style was pioneered by Takashi Amano in the last decade. The style of this type of aquascape is very much focused on nature and imitating both natural landscapes and snapshots of natural environments. This means that a Nature style aquascape can look like a miniature version of a mountain range with tree lined slopes, or like a scene under the surface of a small river. Within each of these styles there are further sub-styles that I'll explore a little further in another article. Great stuff! Can't wait for the follow up articles! Great blog. May I persume you're dutch? I'm having alot of difficulty buying the right plants, and keeping them alive. They are oftennot labeled, or labelled wrong in stores, and Iven if they thrive, the pleco's will get 'm. can anyone tell me what type of plants they used for the fourth pic? If I were a fish I would hope and prey I did not go to a modern trendy home where the owners liked the latest craze. At the moment the latest trend is the fish tank coffee table. Although this type of aquarium looks stunning it is a death trap for fish. Nature aquariums are simply the best kinds of aquariums on planet. It is also good for the environment. As we always say it, it is "art and nature inside the glass!" By the way, here's a good list of aquatic plants to start with. Each style has indeed, their own unique set ups and designs. What you choose as your tank's design must also consider your fish for freswater tanks. Their adaptability to your tank can basically determine their health. I need plants like in second picture.